Today is an exciting day aboard Idyll Time. This is our first day of cruising in the Pacific Northwest. It will be a short cruise of only 32 miles to the town of Sidney. Having never traveled these waters, we are a little unsure of what to expect. Daylight comes early up here and we push away from the docks at 5:30 AM. 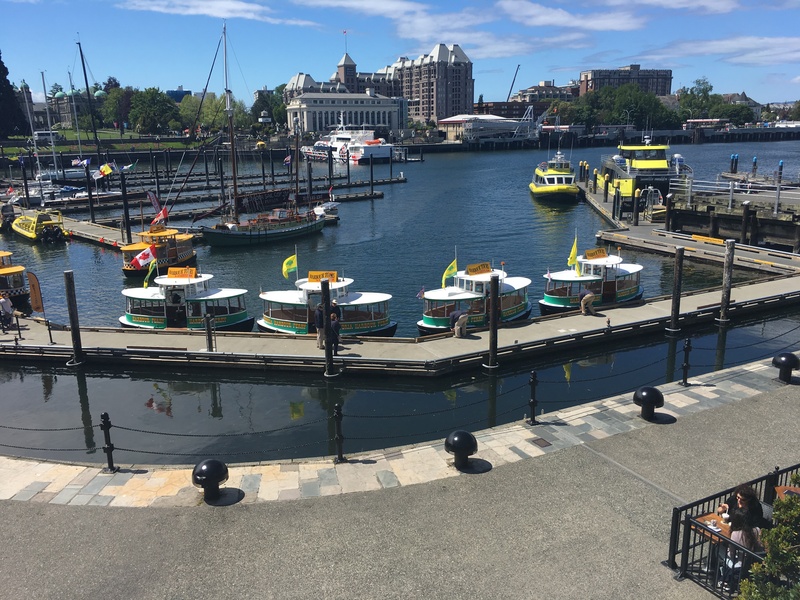 The Victoria inner harbor is still asleep on this dreary grey day. With no float planes, high speed ferries, or water taxis to contend with we can appreciate our surroundings a little more than yesterday. As we reach the outer harbor, we have some big rollers on our bow. 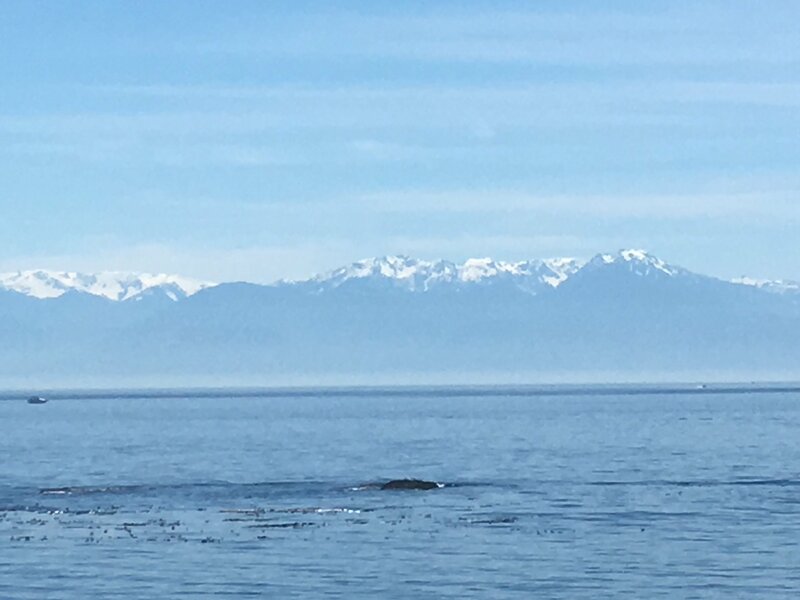 The Juan de Fuca Strait welcomes us to the Pacific with three to four foot seas on our nose. No complaints from the crew today. We are just happy to be back on the water. Once past Discovery Island we enter Harro Straight and the seas calm down dramatically. We are traveling close to shore staying well out of the shipping channel yet still in 300 feet of water. The tide is giving us a good push and we are flying along at 11 mph. 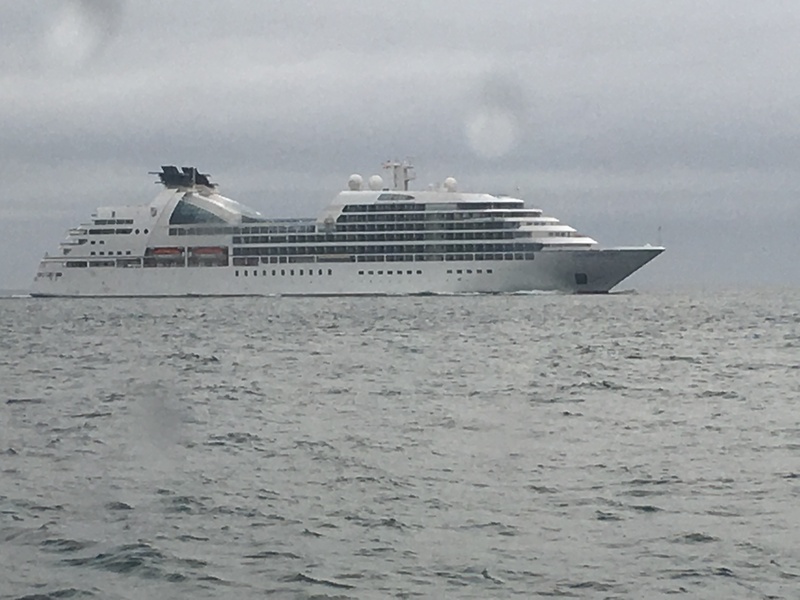 A huge cruise ship appears on the horizon. We chat briefly on the VHF about our passing intentions. We assure the Captain that we intend to stay well out of the shipping channel. The remainder of the trip is uneventful. Our only worries are dodging the huge semi-submerged logs, some 20 ft. long, lurking just below the surface. We had been warned about these logs from other boaters. To see them now is very sobering. Most boaters out here do not cruise at night because of these logs. We like to travel at night but after seeing these wooden leviathans we are strongly reconsidering nighttime travel. The body of water we are now cruising on is known as the Salish Sea. This term includes the straits and inlets of Northern Washington and British Columbia Waters. The Salish are the indigenous people of this area. 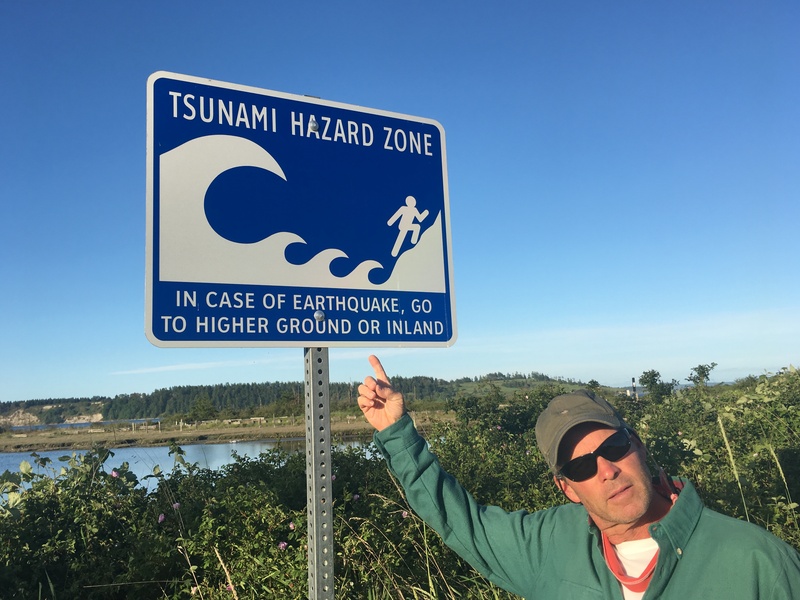 This term was created in 1988 by a Washington biologist in an effort to increase awareness for these waters and ecosystems. It is hard to describe the beauty and grandeur of this area. The snow capped Olympic Mountain peaks towering in the distance and cold clear water under our keel provide a majestic and inspiring scene. We feel so blessed to be able to explore this area in our own boat. Idyll Time is now safely berthed in Sidney,B.C. at Philbrooks Boat Yard where diesel heaters are to be installed. 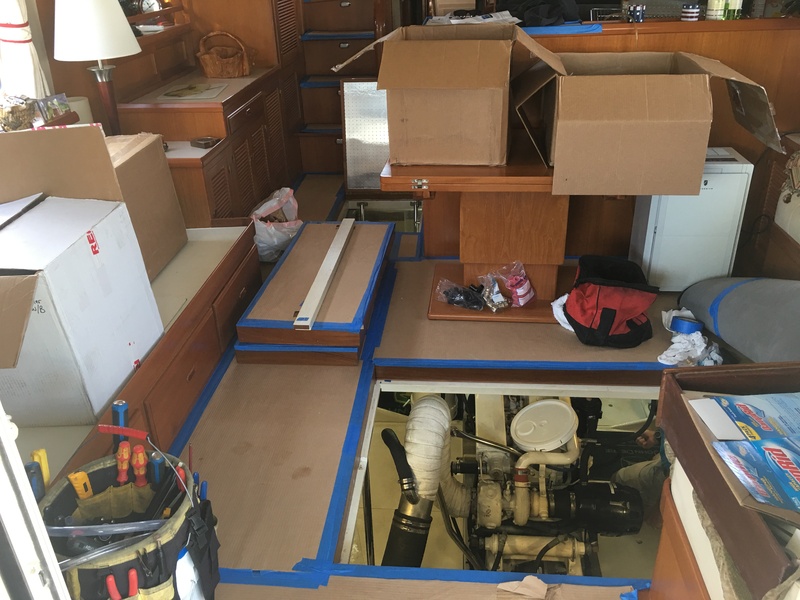 Our reverse cycle heating and air system that we used on the east coast can not draw enough heat from the chilly waters to adequately warm the boat. This will be a big job taking about three weeks and many boat dollars to complete. Everything inside is packed away and all holds and chases are opened up to run wiring and heater tubing. This hydronic diesel heater will work by circulating hot glycol fluid throughout the boat similar to radiator heat systems in houses. We are staying at the Ocean Side RV Park seven miles from the boat yard while Idyll Time gets the heaters installed. Each day we take the Lockside bike trail into Sidney. The town has quickly become one of our favorites. It is such a charming little seaside town. It is a good thing we are riding 15 to 20 miles each day because it is impossible not to stop at the Sidney bakery on our way to the boatyard. With the yard closed on Saturday, we decide to take a day long bike trip to Salt Spring Island. It’s a 12 mile bike ride to the B.C. Ferry Terminal where we catch the 8:30 ferry to Fulford Harbor. Our ferry map shows Ganges Harbor only 6 miles away from the ferry terminal. 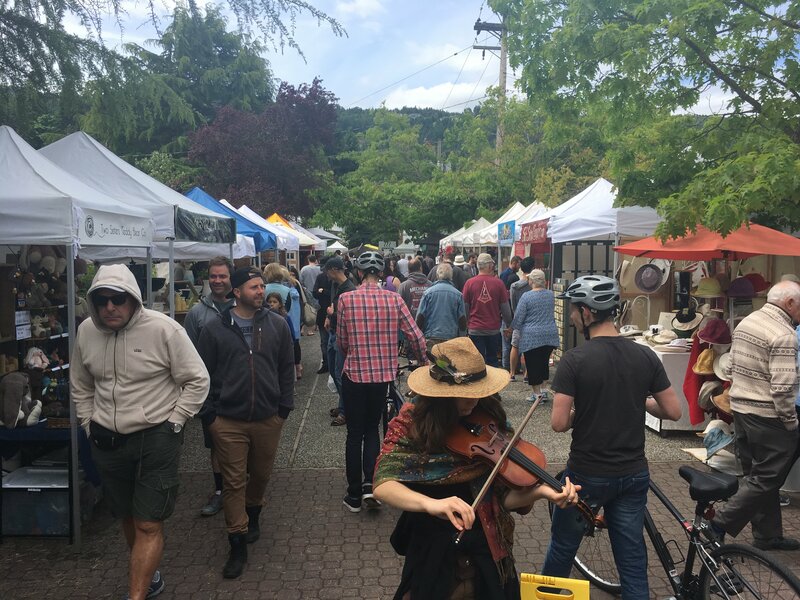 Their Saturday market is said to be one of the best in the area. Six miles on the bike is normally not an issue. It should have been a warning to us when a local resident on an electric bike asked us if we had ever biked the island before. When we responded no, he said “It is a little hilly”. Wow, what an understatement. Right off the bat, the road goes straight up for half a mile. At several points we contemplate walking but our egos win out and crest the top of the hill only to find a long downhill and then another brutal uphill. This scenario is repeated over and over for he next six miles. The scenery however is spectacular and the many self serve farm stands along the ride help take our mind off this torturous bike ride. Nearing Ganges, we have a vertiginous downhill run into the waterfront. Being in desperate need of coffee and high carbohydrate refueling, we make a pit stop at the local bakery on the outskirts of town. The Saturday market is in full swing when we arrive. We spend the next few hours wandering from stall to stall sampling many of the local food offerings while taking in the flavor of the island. Salt Spring is a laid back old hippy community where self expression is highly valued. Many of the vendors here promote an eco friendly lifestyle living in harmony with the environment. With full bellies and our karmas realigned, we reconsider our travel options back to the ferry. Do we ride the torturous six miles back to the Fulford Harbor or do we take take the $1.25 community bus conveniently equipped with two bike racks? Easy decision! We are soon appreciating the beautiful mountainous countryside from the vantage of hard bench seats. We feel like such weenies. 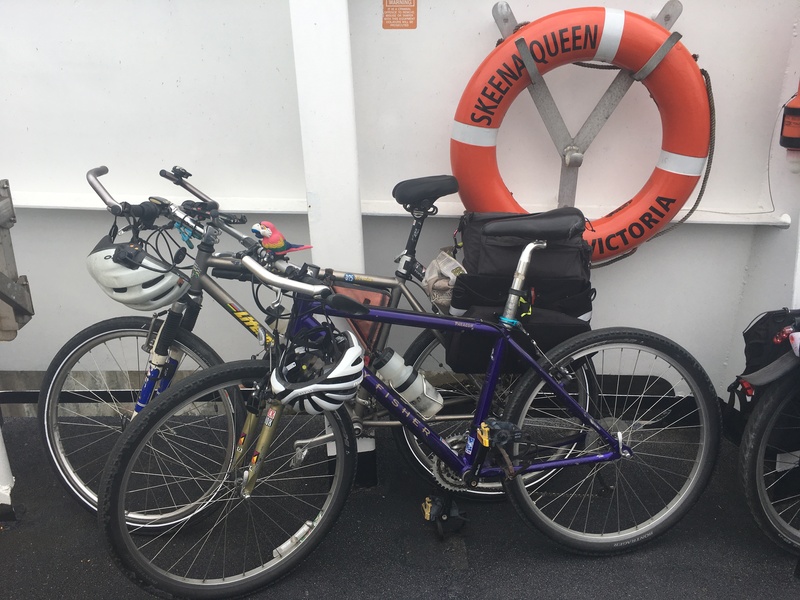 After a return trip on the ferry, we still have twelve miles of bike riding back to our campground. It’s hard to believe we are this tired after only 32 miles of biking as we fondly reminisce the days when we could ride twice this distance and be half as tired. At least that’s how we remember it. With the heater installation well underway, we are now planing a trip in the RV to explore parts of Vancouver Island that we would not get to see by water. Stay tuned, we will report back soon. This entry was posted on June 12, 2017 at 2:55 am. You can follow any responses to this entry through the RSS 2.0 feed. You can leave a response, or trackback from your own site. 1 Response to "Victoria to Sidney"
Ahhhh, Salt Spring Island! We stumbled on that place several years ago, exploring in our car. What a wonderful place. So glad you are there and Idyll Time arrived safely.